These are huge molecular models, spanning up to several metres and guaranteed to make an impact on visitors. We originally designed the giant molecular models for large static displays in schools, but it’s up to you what you use them for. Whether you want several small models to represent a variety of compounds, or a single massive installation of a molecule comprising many atoms, we can help. The original models have been adapted to make it possible to repeatedly assemble and disassemble the models you make with them, making them ideal for teaching large groups and for activities involving younger children. So, when you really need to grab people’s attention from a long way away, we offer giant molecular models with ball diameters up to 15cm, at scales of up to 20cm=1Å, with the possibility for even larger scale models. 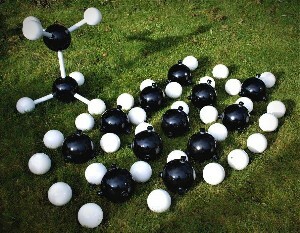 As with our standard range of models, giant models can be made of any molecule or crystal that you wish. Giant Molecular model kit or prefab - which is better suited to you? We split our giant molecular models into two types - those intended for static displays where the model will be displayed and not changed. These are perfect for permanent installations in schools, universities and company headquarters. Alternatively, our giant molecular model kits are perfect for dynamic demonstrations that require the models to be disassembed and reassembled, whether than is teaching in a large lecture theatre, or providing entertaining educational activities for children in a museum.. Giant molecular models for changing models.